The Hawks do not demonstrate that Gordhan intended to unlawfully influence South African Revenue Service official Ivan Pillay and therefore do not have a case of corruption in connection with bringing Pillay back onto the books soon after he retired. When an elite crime-fighting unit investigates a member of Cabinet, what does the rule of law require? In South Africa the Directorate for Priority Crime Investigation (the Hawks) have been circling finance minister Pravin Gordhan. Two main narratives are emerging to explain the ongoing saga. The first is that the minister may have committed some crimes and must be investigated. The second is that the country’s president, Jacob Zuma, is using the Hawks to discredit or harass the minister. The President’s goal, under this second narrative, is to remove the minister from his post in order to “capture” the National Treasury. Those who favour the first narrative argue that if Gordhan is innocent of wrongdoing, the legal process will establish his innocence. He should not be exempted from investigation or prosecution. Proponents of this view point out that nobody is above the law. The best way to explore which of these narratives reflects the truth is to establish what it means for the law to “take its course”. If the law is taking its course, not only will everybody be equally subject to it, but the State itself will exercise its powers only under the authority of the law. So the first step is to establish what the law requires of the Hawks. The Hawks are a unit within the South African Police Services (SAPS) with the mandate to “prevent, combat and investigate … national priority offences”. They are empowered and obliged by law to investigate criminal offences, but have no power to investigate anything else. The latest on the matter saw the Hawks send a letter to Gordhan demanding his attendance at a meeting on August 25 2016. The letter alleged that Gordhan contravened provisions from three pieces of legislation: the Public Finance Management Act of 1999, the Contravention of National Strategic Intelligence Act of 1994 and the Prevention of Corrupt Activities Act of 2004. None of these allegations provide any basis for an investigation of Gordhan by the Hawks. Let us start with the allegations arising from the Public Finance Management Act and the National Strategic Intelligence Act. It is important to realise that legislation may prohibit or command certain activity without rendering non-compliance with that prohibition or instruction a crime. In fact, the two provisions to which the Hawks refer in the Public Finance Management Act provide a good example of non-compliance with the law which does not result in a criminal offence. Cosatu: #Gordhan has every right to do what he did. We need to defend his freedom to question and challenge the Hawks’ actions. Sections 1 and 34 of this Act establish what the legal consequence is of “unauthorised expenditure” (which we can read as expenditure not provided for by law). The Act does create crimes in Section 86, and it does so by providing that people who contravene certain provisions of the Act are guilty of an offence. But section 86 does not mention sections 1 or 34. Turning to the National Strategic Intelligence Act, we see that it creates no offences at all. While we will see below that there is no case to be made that Gordhan did not comply with these provisions, the primary point is that, whether he complied with them or not, it is simply none of the Hawks’ business. If we turn to the “Prevention of Corrupt Activities Act” we find that no such Act exists. Let us assume that the Hawks meant to refer to the Prevention and Combating of Corrupt Activities Act. The Hawks’ letter refers to sections 3, 4 and 10 of this Act and these sections do, in fact, create crimes. These crimes have specific definitional elements and, as required by the rule of law, the provisions set out these elements in detail. In summary, these offences consist of a particular act, which must be accompanied by a specific purpose. The act is the giving of some sort of benefit or “gratification” to another person. The purpose must be to influence that person or another person to behave in an unlawful manner. No sign of alleged crime? The incidents on which the Hawks’ investigation initially appeared to focus were the setting up of a covert unit in the South African Revenue Service (SARS) in 2007 while Gordhan was Commissioner, alleged unlawful interception of communications carried out by this unit, and authorisation of early retirement and rehiring of one of the SARS officials, Ivan Pillay. The Hawks letter of August does not mention the unlawful interception of communications. This may well acknowledge that there is no evidence either that there was any interception or, at least, that Gordhan had anything to do with it. But the letter does claim that the setting up of a covert unit contravened the National Strategic Intelligence Act. 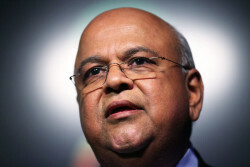 Further, it claims that by approving the early retirement and rehiring of Pillay, Gordhan breached the Public Finance Management Act and committed the offence of corruption. As noted above, the National Strategic Management Act does not create any offences. But it also does not prohibit the creation of a covert unit. It prohibits (certain) governmental departments from gathering “departmental intelligence”. The Act itself defines this as intelligence related to “any threat or potential threat to the national security and stability of the Republic”. It does not prohibit undercover investigation of tax fraud or the evasion of excise duties. If we examine the allegations based on the Public Finance Management Act more closely we are reminded, once again, that the relevant provisions do not create crimes. It is also worth noting that the provisions apply to departments of state, not public entities. SARS is a public entity. Finally, let us turn to the allegations based on the Prevention and Combating of Corrupt Activities Act (12 of 2004). Let us assume that Gordhan’s approval of Pillay’s retirement and rehiring were somehow the giving of a “gratification”. The Hawks’ letter does not refer to any evidence to suggest that Gordhan approved this “gratification” in order to influence Pillay to behave unlawfully. It does not, in other words, allege that the definitional requirements of the crime of “corruption” have been met. On the Hawks’ own papers, there is no crime to investigate. We see, therefore, that the Hawks are prepared to bring allegations against Gordhan which are not only nonsensical, but are obviously nonsensical. They are doing so in a manner which is blatantly outside their powers under law. Like all crime-fighting agencies in a state governed by the rule of law, the Hawks must build a case against a suspect (without the suspect’s help). Then, when they have reasonable chance of a successful prosecution they must bring that case to court. At no stage does such an agency have the power to order anybody to appear before it. It may merely invite a suspect to answer questions in order to clarify aspects of the investigation. The Hawks are exercising powers they simply do not have. 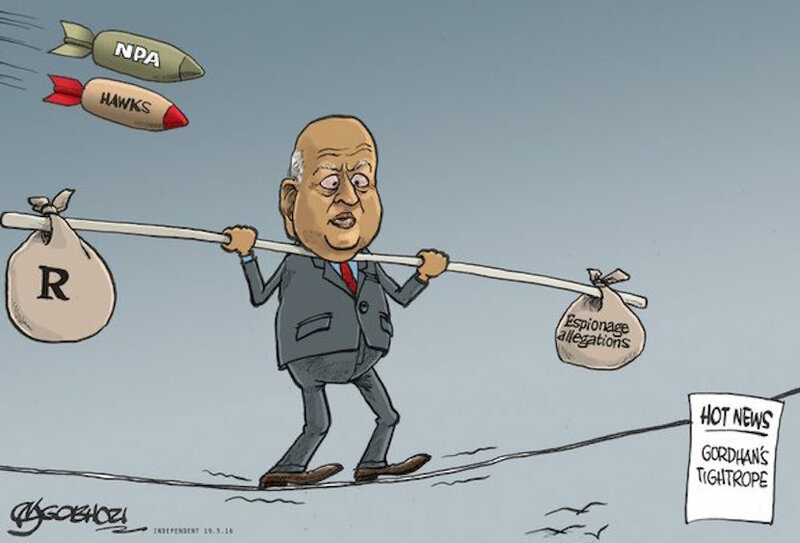 Some commentators, even those who describe the measures against Gordhan as a “witch hunt”, nonetheless suggest that Gordhan should co-operate with the Hawks. This, they say, will indicate that Gordhan does not consider himself above the law and that he respects the institutions of government. And it will help to establish the facts and thereby sort out the problem. But if the second narrative is correct – if the Hawks are being used not to investigate crime but to remove a minister who is obstructing Zuma’s personal ambitions – then Gordhan’s cooperation will not achieve any of these goals. The key terms here are good faith and legitimacy. State institutions lose their legitimacy if they act in bad faith. The head of the Hawks, Berning Ntlemeza, has already been found by a court of law to have acted in bad faith in his running of the unit. This finding established that Ntlemeza acted with an ulterior motive. So what does Gordhan achieve by cooperating with this unlawful demand? It may serve to create the impression that the Hawks have a right to summon him (or anyone else), which they do not. It cannot serve to establish his innocence if the Hawks are not interested in whether he is innocent or not. And, if the intention of the Hawks is to harass, discredit or wear him down, it gives them another chance to do so. There is no evidence to support the narrative that the Hawks are, in good faith, investigating crimes which the minister may have committed. And this brings us to the second narrative, one made more compelling by the court’s findings on Ntlemeza’s integrity. Gordhan is not claiming to be above the law by refusing to appear before the Hawks. He is, instead, vindicating the law which should protect all people in South Africa – ministers and ordinary citizens alike. Cathleen Powell is Senior Lecturer in Public Law, University of Cape Town. This article first appeared at The Conversation.